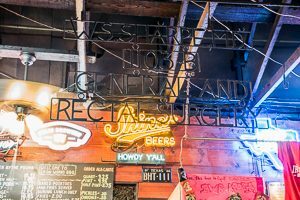 Ironworks BBQ has a funky, lighthearted, informal atmosphere. 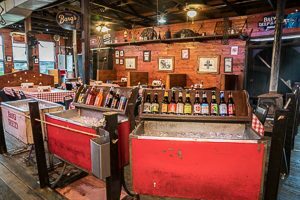 Think picnic tables covered in red-checked oilcloths; uneven plank wood floors; huge fans moving the thick Texas air; beer, soda, and water served ice cold from old-fashioned painted steel ice chests. Its rich history dates to the 1930s when the building originally housed an ironwork business. Lunchtime is popular, but the queue moves quickly, with guests chatting amiably, awaiting their turn to order at the counter. Full disclosure: my vegetarian inclinations are a strong preference, not a firewall. I occasionally eat fish at home, and when I’m a guest, I’ll eat what’s put before me. Left to my own devices, dining at a BBQ joint would not be on my radar. I hereby confess to significant guilty pleasure induced by my experience at Ironworks BBQ. 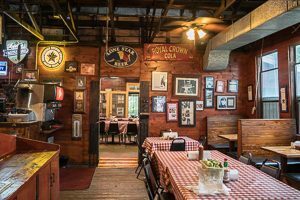 The menu offers all manner of classic BBQ meat: beef and pork ribs, brisket, pulled pork, chicken, turkey, sausage. For those who choose, there are also more than a few vegetarian-friendly options: a salad bar, mac, and cheese, coleslaw, corn on the cob, green beans, pinto beans, and baked potatoes, which can be enhanced with BBQ sauce. I found myself asking for the chicken plate – $10.95 including two sides. The Texas-big portions immediately conjured thoughts of a to-go box, but in the end, nothing remained. It was possibly the most succulent, flavorful chicken ever. My coleslaw and corn were equally delicious. Others in the group concurred: this is seriously excellent BBQ, not to be missed if you find yourself in Austin, regardless of your dietary inclinations. 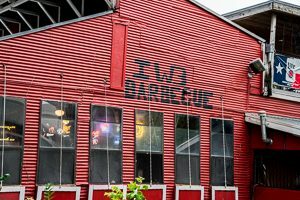 Ironworks BBQ is located at 100 Red River Street, Austin Texas. Enjoy in-house dining and to go orders. Jars of their signature BBQ sauce and rub are available for purchase. Open Monday—Saturday 11-9, closed Sunday. Call 512-478-4855 or visit www.ironworksbbq.com for more info. Taste Philly at the Reading Terminal Market!